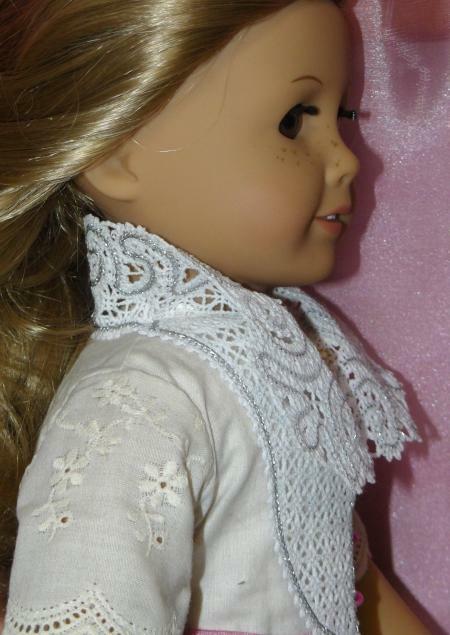 These are instructions on how to embroider the FSL Battenberg Lace Doll Collar designs. 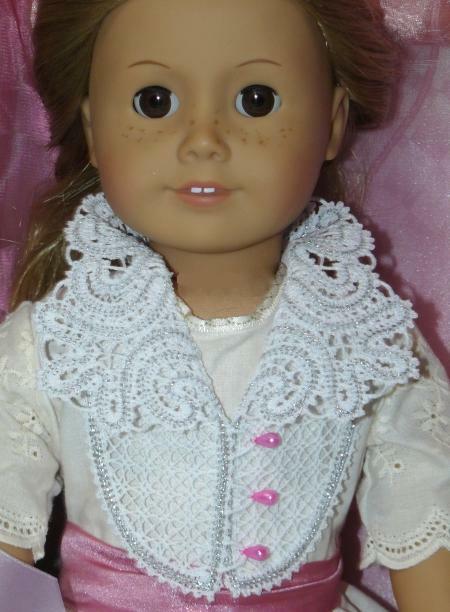 The embroidery can give a unique and classy touch to dolls' outfits. There are 3 files in the set: 2 round collars and a dickey. The round collars each have several colors, so you can choose colors to best match your project. 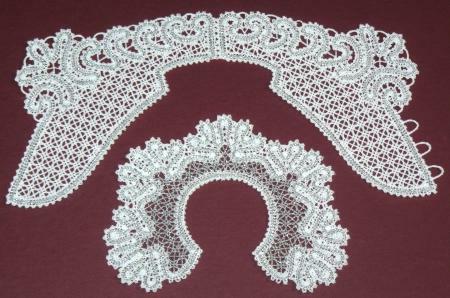 To embroider this type of lace, please read our recommendations. Stabilizers: We recommend to use water-soluble mesh, such as Vilene. Vilene D0102 is a non woven dissolvable stabilizer which is imported into the US, is sold in large rolls and is sometimes repackaged under different brand names. Two of these brand names are Wash-Away and Aqua Magic. Film-like water soluble stabilizers, such as Solvy, are not suitable for Free-Standing Lace embroidery. Wash away the stabilizer in luke-warm water! Threads: The thinner the thread, the finer the final product will be. That is why we recommend that at least one of the threads, either in the bobbin or in the needle, should be cotton, which gives bulk to the lace and makes it look hand-made. Embroidery polyester thread will make very fine web-like lace. Embroidery rayon thread is too soft, it does not keep its shape and very often its color fades under the influence of chemicals from the water-soluble mesh. If you are using 50- or 60-weight cotton, you can use it both in the bobbin and in the needle. If you use 40-weight cotton thread for the needle, you can use regular polyester bobbin thread. We used Signature machine quilting cotton thread, but similar threads from other companies should work just as well. Needles: We use size 80/12 embroidery needles and 80/12 metallic needles. Our experience shows that cotton thread used with metallic needles gives less lint. The needles should be sharp, so it's advisable to change them after every project. Most Importantly: ALWAYS make a test stitch-out of the design and wash away the stabilizer. This helps you to select the threads, needles, stabilizers and settings of your machine correctly. DO NOT embroider several designs in one hoop. To attach the collars to a dress or blouse, you need to use thread of the same color as you used for the embroidery. 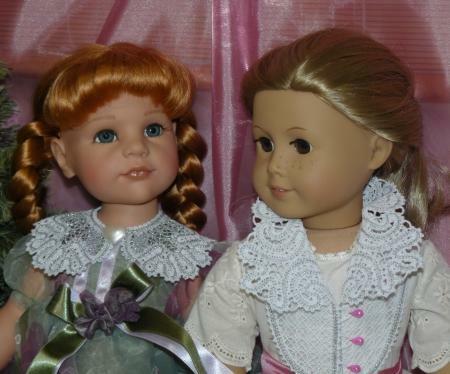 Step One: Embroider the files DollCollar2L and DollCollar2R once each. 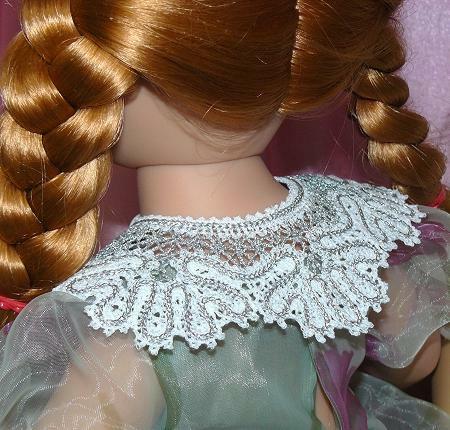 For this collar you will need 2-sided embroidery. To get 2-sided embroidery, use the same thread both in the needle and in the bobbin. Rinze the stabilizer and leave the embroidery to air dry. Step Two: Thread a needle with the same thread with which you made the embroidery. Stitch the opposite loops on the neck seam. 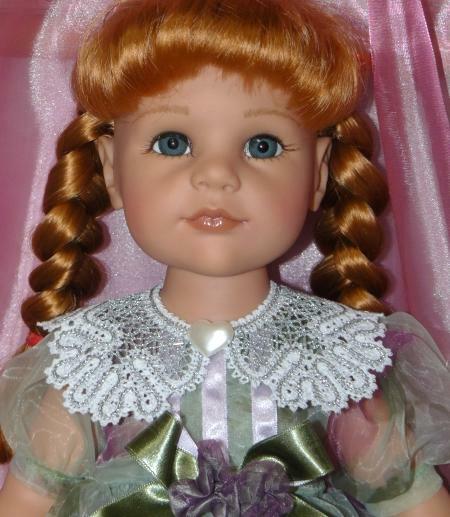 Attach the dickey to a doll's blouse.